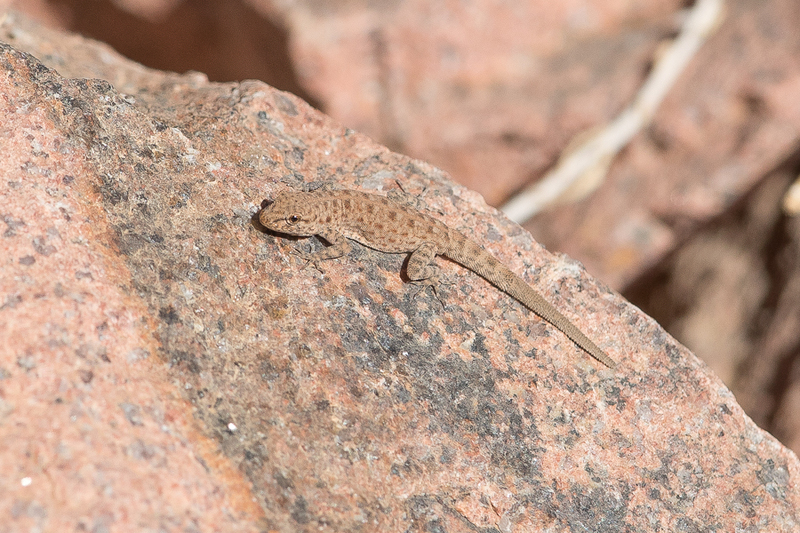 Whilst birding Jebal Lawz I found a small and well camoflagued gecko on a rock at the end of a wadi. It was a Baluch Ground Gecko Bunopus tuberculatus, a small, ground-dwelling gecko with rather short, straight toes, a long tail, and conspicuous tubercles on the back and flanks. The body is generally tan coloured, giving good camouflage against its sandy habitat, and the tail is barred. As this gecko was living in a mountainous landscape with dark rocks its ground colour was dark to match its surroundings. As in other geckos, the eyelids are fused together, forming a transparent covering to the eye, however, unlike many other geckos, it lacks expanded toe pads, and is therefore unable to climb vertical surfaces. As its common name suggests, it lives on the ground, digging burrows in the sand and also hiding under surface debris. It is likely to be active at night, feeding on a variety of insects, spiders and other small invertebrates but little is known about it lifestyle. They have been reported as abundant and widespread in vegetated sandy plains and in coastal habitats and can also be found in rocky deserts and near farms, but are not seen in homes. They are found in the Middle East, Arabian Peninsula and southwest Asia, from Israel, Jordan and Syria, south into Saudi Arabia, United Arab Emirates and Oman, north to Turkmenistan and east to Pakistan.